The People’s Open is an ongoing project that documents the unique, and at times, deviant behavior that takes place at the PGA tour’s most attended event; The Waste Management Phoenix Open. It is a golf tournament unlike any other in the world that has a distinctive reputation on tour and long history of mayhem unfolding throughout the week. 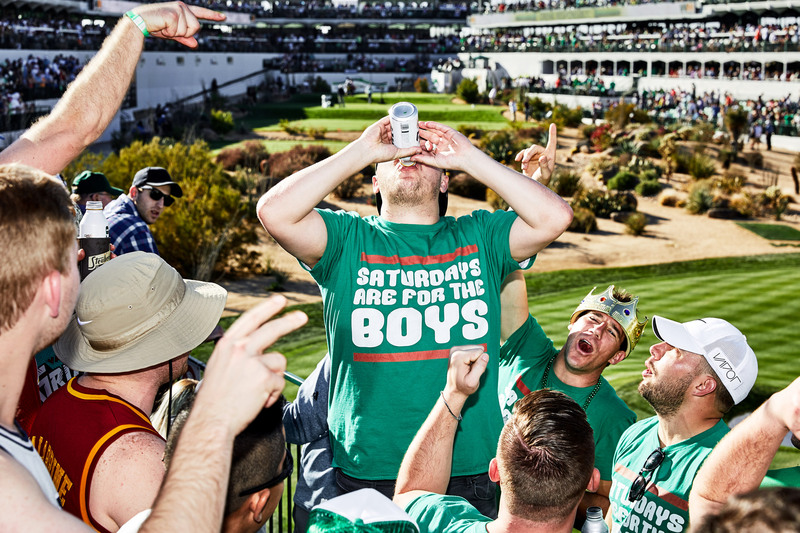 The tournament is more a social event to be to be seen at, a place to get thoroughly intoxicated at any hour of the day, dress up (or down) in costumes, and a safe space to yell whatever you’d like at professional golfers for hitting mediocre golf shots. Sure, if you watch golf you know the environment at the tournament is crazy. However, if you have never attended the tournament on a Saturday yourself, you haven’t seen everything. As a golfer, long time patron of the Phoenix Open, and at times, apart of the chaos myself, I have always been fascinated by this tournament. Each year it shatters the previous year’s already staggering attendance record, continues to aggressively push the limits of what behavior is acceptable at a professional sporting event, and year after year leaves more patrons with cloudy memory and a tremendous hangover. I wanted to get in the middle of the madness and create images that go beyond what is broadcasted on television, and document the tournament as I’ve see it for so many years.